Ireland's Kirsten McGarry finished 50th of 60 competitors in the women’s giant slalom at a foggy Whistler Creekside track. She improved her overnight position by five places with a much improved run of 1:20.92 (9.55 secs slower than the winner. In her firsts run McGarry was placed 55th with a time of 1:24.28 (9.16 secs behind the winner). Her combined time of 2:45.20 put her 18 seconds behind the surprise winner Viktoria Rebensburg of Germany. Eight skiers crashed out of the competition. * A day later, McGarry's Winter Olympics ended on a sour note when she was disqualified from the slalom after one of her skis was judged to be one millimetre too thick. Despite the foggy conditions, she had completed her first run in a time of 59.28 seconds, but the judges' ruling means no participation in the second run. Aoife Hoey and Claire Bergin lay 20th of the 21 teams after the first two heats of the women’s bobsleigh last night. The Irish pair are over three seconds down on leaders Canada at the midway stage. A sluggish first heat found Hoey and Bergin last in the standings although they improved marginally on their second run. Australia, whose appeal had threatened Ireland’s involvement before the Games, is 0.02 seconds ahead of the Irish bob in 19th place. Canada's Kaillie Humphries set a new track record of 53.19 on her first slide and followed that with an even faster time of 53.01. She leads the field by 0.13 seconds going into tonight’s final two runs. Germany's reigning Olympic champion and gold medal favourite Sandra Kiriasis could only manage fifth place on the lightning fast track. Ireland's Pat Shannon finished 25th in the men's skeleton. Final standings: 1 J Montgomery (Can) 3 mins 29.73 secs (52.60, 52.57, 52.20 & 52.36 secs), 2 M Dukurs (Lat) 3:29.80 (52.32, 52.59, 52.28 & 52.61), 3 A Tretiakov (Rus) 3:30.75 (52.70, 53.05, 52.30 & 52.70), 4 T Dukurs (Lat) 3:31.13 (52.94, 52.88, 52.62 & 52.69), 5 Z Lund (USA) 3:31.27 (53.04, 52.85, 52.57 & 52.81). 25 P Shannon (Irl) 2:44.98 (55.18, 55.20 & 54.60). THE OLYMPIC Council of Ireland (OCI) is confident the latest challenge to the Irish women’s bobsleigh team’s participation in the Winter Olympics, starting in Vancouver tomorrow night, has come too late. In a complicated legal challenge, the Brazilian team yesterday appealed to the Court of Arbitration for Sport (Cas) to give them a place in the event, citing conflicts in the way the Irish team had qualified. This followed an Australian challenge, finally resolved on Tuesday night, when Cas ruled that both Ireland and Australia could compete – the only compromise acceptable to both national Olympic Committees. The Australians became the 21st team to qualify. On hearing this, Brazil submited their appeal, even though they had failed when they made the same case to the International Bobsleigh and Tobogganing Federation (FIBT). Cas will hear this case today, with the Brazilians arguing that they adhered to the qualifying criteria, while Irish team only completed part of their qualification late on in World Cup events.However, following the Cas ruling on Tuesday, it would be highly unlikely the Irish team will be ejected. If Cas gives the Brazilians a place ahead of the Irish, they’ll be overriding their own ruling. Clearly the issue throughout has been the wording of the qualification rules. Aoife Hoey, the bobsleigh pilot, will carry the Irish flag in tomorrow night’s opening ceremony. Seán Kenny talks to Dubliner Kirsty McGarry who will shortly represent Ireland in Vancouver at her second winter Olympics (edited). When Jane McGarry was pregnant with Kirsty, she and her husband Ian made Chatel in France their home for the winter, migrating there seasonally, drawn from Dublin by their shared passion for skiing. Until the age of 10, each winter Kirsty swapped home for the glacial white of the French Alps. The children of Chatel had a vast mountainside for a school gymnasium. Skiing was on the school curriculum; literally. When she was nine and her sister Tamsen was 12, they started racing. In 2000, Kirsty won the prestigious Ski D’Or slalom in France. Previously, Tamsen had won the same race. She had been booed. It was against the natural order of things that an Irish girl should beat natives of the French Alps in a ski race. From the age of 10, Kirsty boarded in Rathdown School in south Dublin. She often played truant to go skiing in France, with the blessing of a generous principal. The competing demands of sport and academia were somehow balanced. She left with a good Leaving Cert, but the course she had set through her formative years led inexorably to one destination: life as a full-time skier. It was a peripatetic existence – suitcase, slope, suitcase. Racing here, training there. Apart from the family home in Dalkey, she had no base, travelling all over – North America, Europe, New Zealand. It was a life of rigorous routine. It can be an uphill struggle. If she were Swiss or Austrian or French, it would be different. She has not made money from the sport and is reliant on sponsors for equipment. She receives a share of the Irish Sports Council’s fund for elite athletes. There is a large shortfall, though: coaches and physios to be paid, travel and accommodation expenses. Her family have footed much of the bill for years. In 2008, she came back to Ireland to study physiotherapy in the Royal College of Surgeons. She trains and competes depending on the academic calendar. It’s become fun again. Her otherness as an Irish skier is cast into stark relief by the support received by her competitors from Alpine nations. She grits her teeth and ploughs on against the circumstances. “I know another girl from Belgium, where they have little support as well. She came up to me one day and said: ‘You know, we can never make it, because we’re from small countries. It’s not possible.’ I said to her: ‘Well, if you think like that, you’ll never do well.’ She has actually stopped skiing now. And you could see that coming, because if she thinks like that, it’s not going to happen. She pauses, letting the words trail off into the icy remembered air of a hundred ski hills. This far is further than most get. As far as the 2006 Winter Olympics in Turin, where she finished 32nd of 65 competitors in the Giant Slalom and 42nd of 64 in the Slalom. She has won several medals, golds among them, in FIS (International Ski Federation) alpine races. And now a place on the Ireland team competing in the Vancouver Olympics. She is working with an experienced and supportive Canadian coach in the run-up to Vancouver. Too often in the past negative coaching trampled on her confidence. Her winter ’09-’10 schedule: Christmas and New Year in the French Alps. Return to Dublin for exams. Then back to France for more racing and training, prior to Vancouver in mid-February. KIRSTY McGARRY (24) is set to become the first Irishwoman to compete in successive Winter Olympics. Raised in Dublin, she spent childhood winters in the French Alps, where her parents ran a ski school. Her elder sister Tamsen became the first Irishwoman to compete in the winter Games, when she skied in Salt Lake City in 2002. 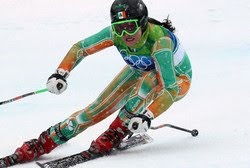 Kirsty carried the Irish flag at the opening ceremony of the 2006 Turin Games, where she finished 32nd of 65 competitors in the Giant Slalom and 42nd of 64 in the Slalom. Having been a full-time ski racer competing internationally for five years, she returned to Ireland in 2008 to study physiotherapy at the Royal College of Surgeons. The Irish two-woman bobsleigh team of Aoife Hoey, Claire Bergin and Leona Byrne are two races away from qualifying for February's Winter Olympics in Vancouver. For Hoey, the prospect of qualification is the culmination of a voyage that started 10 years ago. Her past two attempts at qualifying ended in heartbreak, with Ireland finishing 16th ( 15 teams qualifying) both times in a sport where the major nations are allowed to send two teams. Currently, Team Ireland sits 20th, and since the International Olympic Committee have extended the competition to include 20 teams, Hoey and team-mates are on the brink of making it. "We're in the last qualifying spot and, at the moment, our place is secure. We have two races left to count and the margin is a tiny bit too large for the trailing teams to catch up," says Hoey. "We'll have to finish fairly well to make sure of it, but I'm fairly confident on the next two tracks -- Germany and Switzerland. I don't want to count my chickens before they've hatched, but I think we'll sneak in. I think we've done phenomenally well based on the amount of effort and time, considering we are a very small team." That small team comprises driver Hoey, who is 26 and from Portarlington, and her break-women: 24-year-old Dubliner Bergin and Byrne, who is 22 and from Carlow. Hoey's sister Siobhain, a former competitor, manages the team and will be Irish chef de mission in Vancouver. Aoife followed her sister into a sport that didn't come naturally to the then Irish teenager. 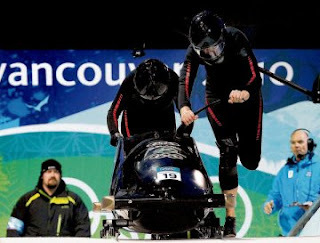 "Siobhain was one of the first women to compete in bobsled for Ireland," she explains. "She knew the men's team at the time eight years ago when there were national trials held at Morton Stadium in Santry. She had excelled in the trials, as from a triple-jump background, she was fast, explosive and powerful. "She came home after being on the circuit for year and told me about how great it was, how tough it was; and from listening to the stories, I wanted to take part myself and I did the trials the following year. I was only 16. "I had to wait until I was 18 for insurance reasons before I was allowed to slide, but I became a break-woman for two, three years behind another pilot. When she retired, I decided I'd have to learn to drive and Siobhain became my break-woman." Training at Santry gave her a slight taste of what she was getting into, but she only realised the true enormity of the sport when she was at the top of the run for the first time. "I'd heard stories about what bobsledding was like, but until you're actually up there you don't realise how fast it actually is." "There's a huge fear element. When I was standing at the top of the run, everything seemed doom and gloom. The weather was very cold - it could be minus-30 degrees, windy and icy - and I had no idea what to expect. I had been told about G-force: some tracks experience four or five Gs. Astronauts might get that sort of force, and the pressure in bends and the speed are unprecedented. "Adrenalin is hugely important, but you have to have an element of fear because you're responsible for your break-athlete in the back. You welcome that little bit of fear, so that I do the sensible thing when I'm on the way down." The team, all still comepting as athletes in the summer, are known for their fast starts on the bobsledding circuit. The IOC have helped by purchasing a state-of-the-art sled, but given the minority status of the sport in Ireland, they've been leaning on friends, family and employers for help. 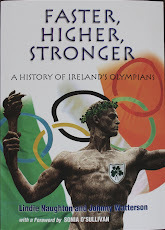 Hoey works for the Athletics Association of Ireland. "It's such a hard sport and we rely on friends and family to support us. My own family has travelled to events - my brother has even helped with pushing the sled. It weighs 300kg and you're talking about three girls heading out in a van maybe nine or 10 hours from one track to another, lifting, moving, dragging a sled and all for a run that takes maybe 30 seconds. "It might take four or five hours of training in one day with 50 or 60 sleds going down in a session; it means it's very intense with a huge amount of work to be done. "The sled has to be prepared every evening after sliding. Polishing them with sandpaper can take four or five hours every evening. The better your materials, the faster you'll be coming down the ice." Stronger bobsledding countries offer plenty of assistance to their Irish rivals. "The other nations have been really helpful to us. Everyone is in complete awe of us because we compete with the best in the world: we're very, very good on the starts. My driving has improved immensely and I think even in four or five years' time, you could be looking at a top-10 finish, rather than a top-20." IT may have brought the country slipping and sliding to a virtual standstill but Ireland's Big Chill of 2010 has, paradoxically, been absolutely no help to Paul Griffin. That's ironic considering the world-class Irish rower has been in a Killarney gym for the past week, sweating his guts out for one final race that will help decide whether or not he qualifies, as a cross-country skier, for next month's Winter Olympics in Vancouver (February 12-28). The big chill is actually more of a hindrance than a help to him.It is immaculately-groomed tracks the Fossa man needs for training, not random snow drifts up in the McGillacuddys. The bizarre weather worldwide -- too hot before Christmas, too snowy now, both contributing to regular race cancellations -- has compounded the logistical problems he has encountered trying to get around the world to pick up Olympic qualifying points. Griffin accepts that he's a bit of a novelty on the international (FIS) skiing circuit, that people see him as some sort of 'Paddy The Eagle' and he can't blame them.Rory Morrish, Ireland's only previous Winter Olympian at cross-country skiing (Turin 2006) once compared himself "to a Norwegian wanting to play hurling" for his native Cork. Given Griffin's even shorter transition, he is more like a Scandinavian wanting to play in the All-Ireland hurling final after just 18 months practice! What most of his competitors probably don't appreciate is that the 30-year-old is a two-time world championship medallist and double Olympian at rowing and one of the finest endurance athletes Ireland has ever produced. His team-mates at the Athens and Beijing Olympics (where they were sixth and 10th respectively) regularly referred to Griffin as "the hardest man" in the lightweight four boat, with an insatiable appetite for training. It was through rowing that he first experienced skiing when then Irish coach Harald Jahrling brought his charges to St Moritz for a winter-training camp in 2005. Aerobic, endurance fitness is the corner-stone of both sports, and cross-country skiers, particularly biathlon skiers who also shoot at targets, are some of the fittest athletes in world sport with resting heart rates of 30-40 beats per minute compared to the average Joe Soap's 70 bpm. After the disappointment of failing to make the rowing finals in Beijing, Griffin decided to see just how far he could go in this alpine sport and some of his adventures already read like a Disney script. It took him two days to get home from his last event in Anchorage, Alaska on January 4, which was the US National Championships. Just 1km into the 15km race he took a tumble and broke one of his skis.He only has two pairs, compared to the top pros who get hundreds to trial each season.For Olympic 'B' standard qualification you need to achieve an average of below 300 points in five official (FIS) races. This was Griffin's fifth so not finishing wasn't an option. Hence he raced back up the hill that he'd just tumbled off at 40 mph, spotted a spectator with the same bindings (the locks that connect your boots to your skis) and borrowed one of his. Even with a pair of mis-matched skis -- he had to produce the broken one for the officials afterwards as equipment is very tightly regulated -- he crossed the line in the time he needed. Yes he was last, in 143rd place, 16 minutes behind the winner. But if he'd been six seconds slower it wouldn't have been enough and 11 competitors didn't finish at all.Afterwards Griffin didn't even have time to check out the stranger whose kindness may yet get him to Vancouver. "I actually came around past him twice more on the circuit!" Griffin explains, laughing at the latest of his many surreal experience that have included racing in Lapland and getting used to landscapes where moose replace sheep. Similar random acts of kindness from complete strangers have been vital to Griffin pursuing his dream of joining the exclusive club who have competed for Ireland at both Summer and Winter Olympics. Only javelin thrower Terry McHugh and rower Pat McDonagh, in bobsleigh, have previously done it. Morrish has been a great help, not least by hooking him up with Rolf Hagstrom, a former waxer for the Swedish national team who has become a huge ally and advisor. Griffin's own international rowing connections have also proved invaluable.While competing at one race he met a former rower who owns a chain of hotels in Sweden who now gives him free board when he's over there training. And yet, though his result in Anchorage was enough to secure the 'B standard', there is a hitch in this snowy fairytale that could yet undo him. The Olympic Council of Ireland (OCI) can only send one athlete on the B standard and another skier currently has a better scoring average (270 points) than Griffin's 299. That's PJ Barron, a Scot who declared for Ireland (through parentage) a year ago. Barron still trains and travels with the British Nordic Development Squad so compared to him Griffin is a lone wolf, with far less experience and support. The OCI have indicated that not just qualifying standard will influence their decision. Next weekend is the qualification deadline and the OCI will make their decision next Monday. After the broken ski in Anchorage the Kerryman has decided to do one more race, in Bozeman, Montana, this weekend in a desperate last attempt to improve his 'best of five' average. Even if he doesn't get to Canada, Griffin's Olympic odysseys will not end here. He is still a world-class rower and hopes to be part of an Irish boat in London 2012 and then there's the next Winter Olympics in Russia in 2014.